I have listed the data in this graph according to the share of those travelling to work each day by different means. A couple of relatively uncommon methods (like taxi and motorbike) have been left out to keep things simple. I am focussing on Bristol because I live there and I have ordered the graph according to the modes of transport in Bristol, a city that is one of the eight core cities in England. As relevant comparators I have also included details for London and for England as a whole. To my eyes five things stand out. 1 By the methods used for the Census in England, Bristol stands out from its core city rivals as a place where people who live there walk to work. It’s a very compact city. Compared to Leeds or Sheffield, for example a brisk half hour’s walk from the commercial centre, in any direction, can get you pretty close to the city boundaries. Lots of residential areas lie within a mile and a half of the commercial centre. 2. Even with only one in twenty Bristol commuters using a bike, Bristol still makes the other core cities look pretty slack. Hackney might be pushing London’s share upwards, but overall, the Metropolis has a long way to go to catch up. 3. As an affluent sort of place, Bristol (despite its chaotic roads) has a lot of residents in their cars in the rush hours compared to the less affluent cities of the north. London (sensible London) is giving up on the car but there are Leeds, Sheffield and Bristol managing to sustain about one in three of their working residents getting into the driving seat each day. It’s interesting to note how few of them seem to give anyone a lift. Only 3% or so are getting driven to work in someone else’s car. 4. I left trams out (very low numbers in general) but Bristol does seem to have some scope to increase its share of workers getting the bus to work compared to other cities. Efforts are being made, but with so many cars on so very few good roads the buses will always struggle to provide the punctuality, fares or reliability that Newcastle or Nottingham seem to be achieving. 5. Bristol has a lot of railway history, a lot of local stations and clear, well-developed plans to improve and increase the opportunities for commuter rail journeys over the next few years. Many of these are (and would be) from places outside the Bristol boundaries (and therefore not visible in this graph of Bristol residents). Nevertheless, growth in rail journeys from anywhere would have useful consequences for competition on the existing road space within the city boundaries. My conclusion from this quick look at current numbers is that Bristol is very well placed to make the most of trends in environmental and public health thinking and to markedly increase the benefits it already gets from a propensity to walk and cycle and to invest profitably in rail travel. Bus services (everyone moans about buses) would benefit from such developments, simply by reducing the overloading caused by so many cars. That overload shows itself in tailbacks and in prolific amounts of free car parking – even on narrow roads that serve as bus routes. Can I also share my morning’s reading? It’s a big fat hint to local authorities (and especially Bristol) that for changes to happen resources might have to be moved from one (declining) activity into something more promising for the future. 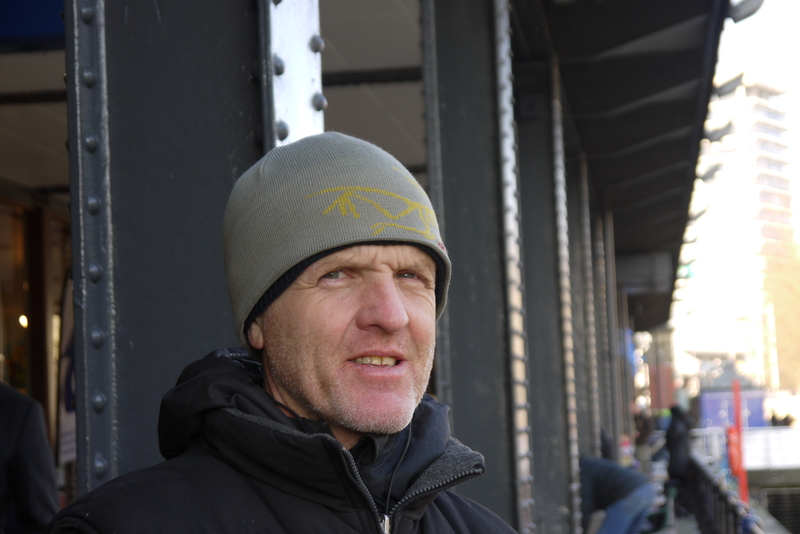 Dave Horton reflects on a bridge in his Thinking About Cycling blog. Considerate Cycling 26: How does Bristol get to work each day? In recent conversations with a pedestrian or two I have heard it said that hoping for more bicycles and less cars is unrealistic. In some ways this blunt appraisal is sane and reasonable. There are so many physical barriers and such deep commitments to the motor car that significant positive change looks very unlikely. It’s also quite clear that many hopeful developments from the recent past are already falling into disrepair and disfavour. I don’t always see things so pessimistically. Someone recently pointed me towards some Census data that seemed to show things in a more positive direction. From it I extracted the graph in Figure 1. Look specifically at the central region of the graph. Focus for a moment on the “Driving a car or van” cluster. A brownish line represents the 32.6% of Bristolian workers who drive to work. That’s a shade less than 1 in 3. To put that another way most Bristolian DON’T drive to work. Look at the same thing for South Gloucestershire (49.5% by car or van) and North Somerset (46%). The people who live there are to a large degree and in various ways a part of Bristol. For Bristol to be so congested (given that most people in Bristol don’t drive to work) the people of South Gloucestershire and North Somerset must be part of the pressure on Bristol’s congested roads every day. To separate funding and planning for a single economic unit into three (never mind four or five) authorities is to harm all the parts. 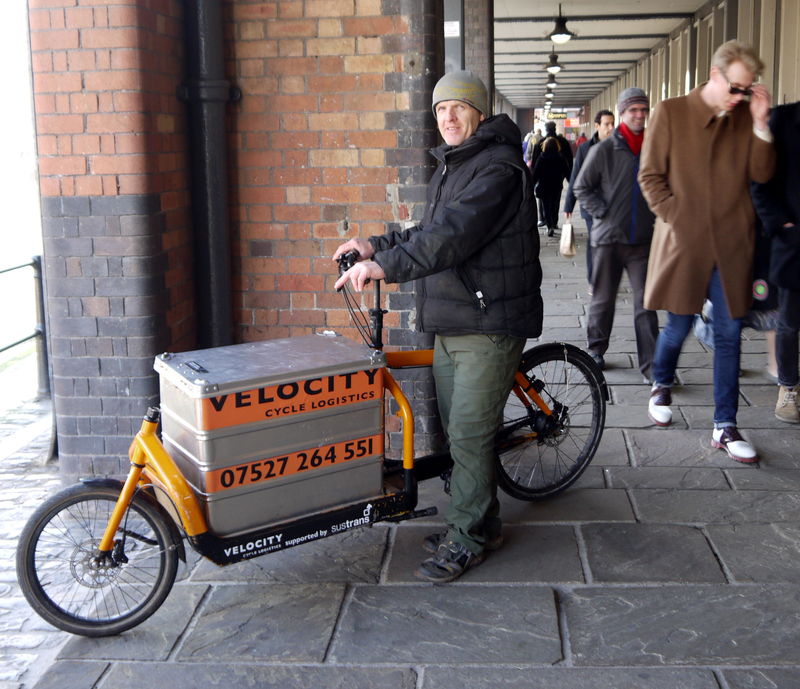 That political question is one that the new Bristol Mayor might be able to address but my main drift is that the variety of transport profiles in such a small and interdependent area suggests that people adapt, that change does happen and that these things are not simply unavoidable or unchangeable. If things can be pulled apart, it should be possible to push them back together. 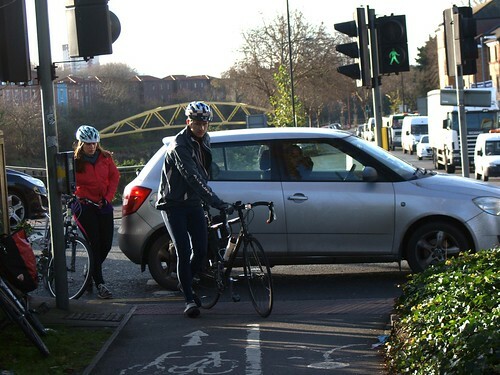 Bristol, having got to nearly one in four people walking or cycling to work should see no great difficulty in shifting it to one in three. With fewer cars on the road, and none parked along the major routes like Gloucester Road, buses would be able to run on time and at lower cost and even more cars could be kept at home. Second cars would become less “essential”. People from Somerset and Gloucester could start to use the improved buses and trains. Some already cycle in , and more could join them. On balance, I’m much more optimistic than I thought. Lewis figures for cycling right now, combined with other observable realities, suggest to me that if Bristol City Council and its Mayor got to work on realistic targets, 2021 could look very different to 2011. There is, for example real progress on local rail and serious talk of Quick Win changes that could establish a stronger base for a coherent cycling network that didn’t just cause grief for the pedestrians we started with. What follows is an edited version of the transcript of an interview I did with Mick Mack at The Watershed in Bristol in mid-January 2013. I prefer not to spoil interviews by asking questions. My prompts are indicated in italics. I asked Mick if he would do an interview, having met him a couple times at cycle places around Bristol. He seems to me to be a very strong kind of cycling campaigner, someone who really does want to get on with doing practical, useful work, on a bike. My name’s Mick Mack. I was born in Liverpool. We moved away from Liverpool in 1970 when I was 8, down to Sussex. We kind of moved around a bit, my father looking for work. And we ended up in East Anglia, in Cambridgeshire on the edge of the Fens. I spent ten years of carnival, building floats and making costumes and performing music and dance with Brazilians and Trinidadians, only within this country. I haven’t gone abroad to do any of this, just bumped into a lot of people. But I’ve moved around the country doing it in Birmingham and London and here in Bristol. So I did that for ten years which was brilliant experience. I loved it. It wasn’t much of a career but I had a good time. So I did that in various places both self-employed and working for companies. And then ended up working on a biodynamic farm up in Thornbury, working with pigs and cows and sheep and goats … chickens, which was quite an experience. I’m not sure I’m much of a farmer. I’m more of a gardener, but I’m glad I did it. And then with the recession and everything I was finding it difficult to find another job other than going back up to London. 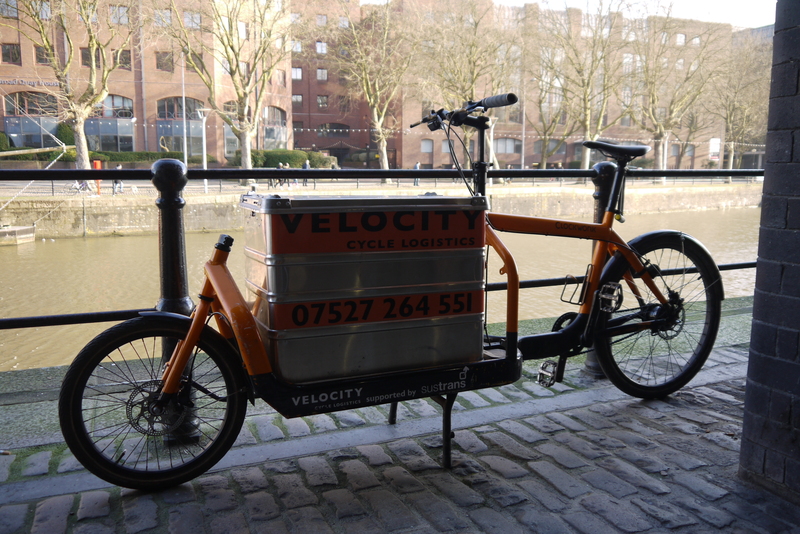 I decided to try this cycle logistics idea because I had had it before but had done nothing about it, here in Bristol. This was about May 2011. The first thing to do was find some money to get things going. So I put several emails out to companies that I thought would like the idea, people like Triodos and Sustrans and The Environment Agency, you know, big organisations with money who might like the idea. I said in the email I sent them “I have got this idea, I think it’s a great idea, I hope you think it’s a great idea, I haven’t got any money do you think you could offer me some business and by the way can you sponsor the idea by supporting us with £300 quid” And I thought that if I could get half a dozen of these and it goes well that would be enough to get a decent bike and start. And then it was just a question of trying to find custom, which is proving an ongoing problem. I pitched for work for loads of different companies: retail outlets, institutions like the University. the NHS, Post Office. I’m still in negotiations with Bristol City Council to try and get work. Everyone I speak to, no matter what kind of level, they all think it’s a great idea but they’re not moved to make a decision to use it or at least to try it to find out. So essentially that’s where I am. I’m still doing it. I’m a year down the line. And I’ve learned a lot about what’s possible in terms of what people are open to since then but still I don’t have enough ongoing contractual work to make it viable really. It feels like I’m living on borrowed time with this but I’ll keep going for as long as I can. In the meantime a lot things have happened which are, are as I say to people, “the bigger picture”. In July of last year in Cambridge a group of like-minded people from all around Europe set up the European Cycle Logistics Federation whose central remit is to find ways of developing the market for moving goods that are currently being moved by motorised transport around urban environments onto bicycles of various sorts. And we have hooked up with the Chartered Institute for Logistics and Transport to say we would like you to help us to make this happen, basically acting as a broker. We’re not asking for money. They don’t have to splash out to promote us or anything , just to kind of introduce us because some of their members are some of the biggest logistics companies in the world, people like DHL, UPS, TNT, DPD, FedEx… those kinds of people who are moving millions of items around the world every day. And at some point all of those items get to within a couple of miles of their destination and they get vans going to a distribution centre filling up and then running around the city delivering these goods. And we in the Cycle Logistics Federation believe there are lots of reasons why this is not a good idea. There is congestion, there is pollution, there is access there is potential for accidents. And I have spoken to a lot of the drivers of these vehicles and they find it very frustrating doing their work, not only the amount of goods they have to shift within a given time frame but also the traffic and getting access down small lanes where they are delivering one parcel … When, if they were to do away with that system and start using bicycles instead all those sorts of problems that at this point they are able to get around would disappear. There wouldn’t be any need … even if it’s in the companies themselves, it’s not about companies like me getting that work necessarily. Because if the UPSs, and your FedExs decide to go with bicycles and use their own livery and their own riders then that’s good for everyone because, number one it shows it can be done, and two they would only be doing it because it makes sense economically. So it encourages other people out there to see the positives, the benefits and hopefully start to do it for themselves. Whether it’s for freight movement, which is what I do, whether it’s postal deliveries, which some other companies around the country are focussing on, or it’s people getting pedlars’ certificates. Well, Basically I never learned to drive a motor vehicle or get a driver’s licence so I have always got around by public transport, on foot or by bike, ever since I was a kid. To me it makes a lot sense particularly in an urban environment. And over the years as I have become more aware of the transport issues I feel even more committed to the bike. One of the arguments that I put to Malcolm and Melissa at Sustrans when I spoke them, was that in terms of bikes in sport there’s a lot of uptake of bikes in sport now. It’ s big, there is a lot of money going into it, it’s got a good image, it’s really strong in various ways, whether it’s off-roading, or track or road or whatever people are into. I don’t have a problem with what people are into, that’s good. And then there’s the leisure or commuting types of cycling, people getting to and from work, going touring, or families riding during the summer, going on day trips, hiring bicycles. All those aspects are going really well. And people like Sustrans who put in a lot of time and energy into creating cycle networks, encouraging people – brilliant! That’s all going good. But for me the bike is essentially a tool. It’s for doing stuff, whether it’s carrying you from A to B or it’s moving goods around. You only have to look back sixty or seventy years, it’s not a new idea. Before the motor car became the dominant mode of transport bicycles were moving stuff around, whether it was the local butcher of baker or greengrocer. And it’s essentially capturing that same spirit. Bicycles could make city centres a lot more people friendly taking as much as, …well the European Cyclist Federation believe that we could potentially lose between 25 and 50 percent of all commercial traffic in the cities over time and with good planning and everything. And ideally the planners and the politicians and big business would come together and see the logic and rationale of it and start to make things happen themselves. But unfortunately it doesn’t seem to be the case. Part of the motivation for getting the Chartered Institute of Logistics and Transport on board was because I had seen two reports that they had put out within an eighteen month period that were envisioning the future for logistics and transport – trains, planes, shipping, roads and it didn’t include the bicycle at all. It had no mention of bicycles at all. So it wasn’t even on their radar. So I sent an email off to the Chief Executive of the Chartered Institute and said “What’s going on, are you and your people not looking around you and seeing the potential of bicycles?” And to be fair they saw what we were saying and since then have started to work with The European Cycle Logistics Federation to try to see how we can help move this forward. We are hoping this Spring to have a big roundtable meeting with all the major transport logistics companies – DHL, Fed Ex and the like just so they can at least hear the story and how we could potentially work with and help them even if, as I say, they do it themselves. As far as I’m concerned, that’s a bigger point than any one individual company getting work. Even if I stop doing this six months down the road, as long as someone is carrying that notion forward and pushing it and trying to make it happen, then that’s good enough for me. There is an upsurge in interest, in all things bike at the moment; partly because of The Times and the whole safety issue. But even the bureaucrats are realising that they can’t continue in allowing companies and individual citizens to continue buying more and more cars and snarling up the cities, It just doesn’t make any sense, not to anybody. A lot of it is to do with breaking down these barriers of fear and safety and who goes first, and all the rest of it. So we’re just playing our part and we just happen to be interested in making the commercial or as I put it, the economic argument for bikes and for the contribution to making the urban environment a much more pleasant place to be. Any examples of your own cycle jobs? For me it’s fairly straightforward and mundane day-to-day stuff. I’m lucky in a sense. I’ve done a lot of work for florists which is really nice. One, they’re very light so I’m not lugging heavy goods up and down Park Street or Constitution Hill day in day out. And two, when you get to your destination people are very pleased that you are bringing them flowers. But that’s the courier side of things and we want to move it onto the logistics side of things. If someone comes to me with 5,000 items they want dispersed all over Bristol then I have to find a way of working out how I can do that without running myself ragged. Basically there has to be a methodology. This is where logistics comes in. It has to be considered and thought out. Not only from the economic point of view but from a physical practical pint of view. And that’s the kind of place we want to move to. I’m wholly convinced just by all the dialogue I have with like-minded people and all the people I talk to and people who have been in this business a lot longer than me, the transport and logistics business, that this will happen. Five, maybe ten years down the road this will be the norm in urban environments I believe. I’d like to think that most people will believe it to be a good thing. Well hopefully… We’re talking to the Council, and the people we are talking to are resistant because they are afraid of what the implications are for them as individuals and as an organisation, job security and all the rest of it. But I believe that in terms of the economic situation organisations like the Council will see the benefits involved and because of the image they want to project in the City that they will get on board with it. Whether they do it themselves or work with external providers or contractors remains to be seen but at some point it will happen. What about Bristol’s roads? Do they have the capacity? Well, If you got to the situation where you had the problem of trying to cater for thousands of bicycles moving goods around the city, that would be a nice problem to have. I don’t know. I’m not an engineer I don’t know what the problems might be. I’d like to think we can wait till we get to that stage: they’ll be thinking about that as and when it grows. It’s not going to happen all of a sudden overnight. I think there is a genuine possibility that at some point some company that’s already running a similar sorts of operation like GNEWT or the like and just sort of jump in with all the professionalism and marketing know-how and transforming the situation in a relatively short space of time. If you look at different parts of the country people are up to all kinds of things. The biggest company in this country is based in Cambridge. They’re called Outspoken Delivery. They’ve got a dozen riders and they are working with more than 200 different organisations on a regular basis, from cake shops to The University. And, this is a point I would like our local council to take on board… to at least consider: over in Cambridge the local authority have got a policy, between 10 and 4 on every working day, to close the city to motorised traffic. People just don’t appreciate and understand what the potential is and I would like people to consider that. An earlier blog told the story of a micro-local issue that had failed to get a resolution over at least 25 years. It seemed to me that the problem was clear and that a cheap and non-controversial solution could be easily found and quickly implemented. The vogue for localism and community involvement made me feel even more optimistic. “The issue was considered at last week’s Traffic and Transport Sub Group meeting however this issue was not prioritised as one needing imminent funding. This does not mean that the scheme will not be considered for future funding as the group still has funding available to prioritise more schemes in the new year. The group considered all the local traffic schemes against the Neighbourhood Partnership Priorities and also after considering technical information from our Traffic and Transport officers. As this local issue has been raised through the NP process, we will keep this on the Neighbourhood Partnership Traffic list which will be revisited by the group every 3 months and will also be considered when future funding becomes available. I am afraid that the Traffic and Transport Sub Group meeting’s failure to prioritise the issue of access along The Fosseway is a great disappointment. Given the strength of the case for action, the direct and daily problems experienced by the 50 signatories to our petition, and the 25 years of delay in resolving the problem I believe that the matter should now be brought urgently to senior members of the council and the Mayor. Such changes and uncertainties have been another of the ways in which our case has been put aside in the past while no substantive arguments against the request have been communicated. The inhabitants and owners of 30 retirement flats deserve a positive resolution to their problem in the very near future and the cost to Bristol City Council is likely to be very small. I am forwarding this email to The Mayor’s office, to Clifton Councillors Janke and Blythe and to Jon Rogers who has had an interest in the welfare of older people in Bristol and in transport issues. I hope that they will be able to take a view on the matter and agree that action is long overdue. Many thanks for keeping me in touch. The Fosseway is used by residents not only from The Fosseway but also Saville Pl, Clifton Rd and Richmond Terrace. A reduction of parking places will bring considerable inconvenience to a wide area. The Fosseway is but one of many roads in Clifton and the wider Bristol area that are narrow, are we going to reduce parking in all of them? With cars parked on both sides it is perfectly possible for an ambulance to access Fosseway Court as I have witnessed, remember we get a dustcart down the road to Fosseway Court every week. If pressed we will produce a petition which will I fear swamp the number of signatories on yours. I would counter as firmly as I can. This is not a parking problem. It is a unique problem of access. There are instances of roads very close by where full access has been made possible, quite rightly, by restricting parking on one or both sides of the highway. See the photographs in my blog. Many Bristol roads are narrow and many of them have managed to get by with single track access but none of them, as far as I can tell, have a dead end so far from the entrance with so many flats and so many vulnerable people (and their support services) dependent on the inadequate access. Parking is not the main purpose of the highway and should never take precedence over the primary purpose of access, however many people might want to sign a petition. People have the right to use a vehicle and a corresponding duty to drive and park it in ways that do not interfere with other people’s rights of access. A local authority has a responsibility to protect the few and make wise decisions about priorities. As you know from your own situation, a right of access to your own property (however infrequently you might need it) is more important than and takes precedence over the opportunity that others might want to take in restricting it. In the case of The Fosseway even a couple of passing places along one side would enable care workers to visit their clients with fewer delays and less anxiety. The status quo is simply not a sensible or reasonable state of affairs. Your comments about ambulances and dustcarts are not strictly true. While it is true to say that they often do get all the way along there have been several instances where they have been unable to do so. Old people have been wheeled the full length of the Fosseway to get between flat and vehicle and vehicles have had to be moved to allow a fire tender to get access to Fosseway Court. Dustcarts do find their way blocked from time to time and do have to make return visits, sometimes on another day. These are not common events, but they should never happen at all when a simple remedy is available and when there is no specific need for so much parking in one road. The most interesting thing about this final exchange is the Councillor’s honest and open expectation that people who own houses and flats in a district have a rightful expectation of being able to park their cars on a road close by, regardless of other residents’ need for safe access and irrespective of the parking prohibitions already imposed on their own streets. In effect, 50 people asking for help can be trumped by 100 people saying it doesn’t suit them to allow the help. In a more rational world a resident in a crowded and desirable city location with a car but no garage or hard standing to keep it on should expect to pay for an alternative rather than insist that access on narrow public roads should be restricted in the interests of their own free parking. As it stands the motor car seems to make monkeys of all of us. The Conservative-Liberal Democrat Coalition passed a Localism Act late in 2011 granting local authorities the legal capacity to do anything that an individual could do as long as it was not specifically prohibited. This represented a significant shift in the principle that had always prevented Local Authorities from doing things they hadn’t been expressly told they had to, or were specifically empowered to do. Fierce budget restraints have brought strong restraints of course, but the new freedom has enormous potential for local autonomy in the long term. The issue I have in mind is the simple case of The Fosseway, a narrow Bristol cul-de-sac, that offers unrestricted free parking on both of its sides while serving as the sole access road to a block of 31 retirement flats at its closed far end. The flats have no road access apart from The Fosseway and all vehicles must pass along its 120 metre length to visit or to leave. The daily problems that arise are clear from the next picture. A refuse collection vehicle has got stuck part-way along the road and a waiting Royal Mail van is unable to make any more deliveries until the problem is sorted out. Representations have been made to Avon and then Bristol Council over more than 20 years, with prevarications and administrative changes alternating as reasons for not doing anything. In the current era Care Workers, who make multiple daily visits, are particularly badly affected by delays. They lose contact time with clients in Fosseway Court and elsewhere. The Fosseway itself (see next illustration) was developed as a row of 8 semi-detached houses adjoining a new roadway in the second half of the 19th century to one side of Clifton graveyard. Most of the houses are now in multi-occupation, with 17 separate dwellings. Larger houses facing Victoria Square were built on the other side of the Fosseway, a little further away, with a high rear wall separating them from it. In 1988 a new block of 31 retirement flats was built to the rear of The Fosseway’s houses, with a private driveway leading off the southern end of The Fosseway. The old Chesterfield Hospital already had a gated emergency vehicle access onto The Fosseway (see picture below) before Fosseway Court was built. It has since been demolished, but a new hospital is in the process of being built on the site, and the same gateway is designated in its planning conditions as being an emergency exit. By 2011 the problems had become worse and the failure of Bristol’s various local government bodies to act looked incomprehensible to anyone arriving (as I did) to see the situation for the first time. On top of the self evident difficulties that had been present from the outset, a number of wider changes had started to make conditions even worse. For example, between 1994 and 2011 the number of cars on British roads went from 25 to 33 million. Data on all of the most popular models on UK roads at the end of each of those years suggest that the mean width of a motor car had increased from 1660 mm to 1903 mm over the period. In addition, student numbers at Bristol’s two universities (a good indicator of general activity in the Clifton area) went from 36,000 in 1995-96 to 50,000 in 2010-11. (data from Department for Transport, http://www.parkers.co.uk and Higher Education Statistics Agency respectively. Interpretations my own). A point has been reached where the slight convenience of 25 free parking spaces for a few non-residents has to be looked at from a less cautious perspective than the one that seems to have prevailed over the years before the Localism Act. The daily access needs of services, care workers, family visitors, delivery and collection vehicles (not to mention emergency vehicles) need to be seen as more important. They reflect the urgent needs of a significant number of elderly people who live in Fosseway Court and they have an impact on the effectiveness of the services whose tasks elsewhere in the city are being disrupted by obstructions and delays along The Fosseway. The occasional free and convenient parking spaces for some have turned into a daily problem for residents who rely disproportionately on a single vehicle access to their homes for basic services. Specific incidents have included a discharged hospital patient being pushed in a wheel chair for 200 yards on a cold rainy day because an ambulance could not negotiate the narrow gap. Fire Officers have had to stop and lift cars off the roadway to gain access to a (luckily) false alarm. Waste collections have been regularly missed on the due day for lack of access. A recent coach journey to a funeral had to be made in stages, with two smaller vans taking residents to the larger bus at the top of The Fosseway. Some residents have found that old friends no longer want to visit because of the difficulties of driving in and out. Even riding a bicycle past a car coming from the opposite direction is impossible. Some of the parked cars are left for weeks on end – presumably kept by students who keep them just for the journeys back home. Careless parking, well away from the curb, is common. By way of contrast, the narrow Richmond Lane , very close to The Fosseway and also giving access to retirement flats, has been kept clear with double yellow lines on both sides. Round the corner in Richmond Terrace there is a section with good access where double yellow lines have been put on one side. Since I wrote the first draft of this blog Bristol has elected a City Mayor and central control of local traffic affairs has changed again. In theory both of these things will make it easier and more likely that The Fosseway will get the parking restriction it needs. Inevitably the change in regulation has created another delay as officers anticipate a chance to implement it at less cost if they wait for when the next new scheme is in operation. The next public opportunity to press the case will be at a Clifton and Cabot Neighbourhood Partnership Meeting on Tuesday, 22nd January 2013. The Fosseway only needs restriction on one side. The current fifty spaces could be reduced without detriment to those who actually live in the street’s 17 dwellings and there would be a dramatic improvement to the lives of those who live at the end of it. The Fosseway can finally be made into a serviceable highway and stop being used as a rather awkward car park. Today’s wider emergency vehicles should not be impeded unnecessarily. I’m writing to let you know that I am not reassured by the reassurances that you and Nick Clegg have offered over the NHS and Social Care Bill. The professional bodies, trade unions and a range of experts are far more convincing (I’m afraid) than politicians whose party interests are supported by mere commercial enterprises rather than by dedicated membership bodies with personal commitments to service. To put it another way, this weekend could definitely be the end of the credibility the Liberal Democrats have had in previous Parliaments. The chance that any LibDems would remain as Bristol MPs at the next election would have to be close to zero. It’s not alwasy easy is it? For most people that will be all you need. However, for a closer look in this blog I called Sustrans who happily sent the 12 pages of tables from which they had drawn the bold conclusion. Q.1 Do you think it’s safe to cycle on roads in built up areas or not? Q.2 Do you regularly, by this I mean more than once a month, cycle on roads in built-up areas, or not? Q.3 What, if anything, would make you more likely to cycle or cycle more regularly, on roads in built-up areas? Q.4 Some councils have reduced the speed limit on residential areas to 20 miles per hour to make the roads safer for pedestrians, cyclists and drivers. Do you think all councils should do the same or not? Question 1 “do you think it’s safe… ” leaves out Hembrow’s idea of three kinds of “safe” and demands a simple Yes/No response. Question 3 asked about suggestions for improvements with the option to choose as many as were relevant. Slower cars as a result of lower speed limits; more marked cycle lanes; More care taken by drivers; More care taken by other cyclists; Nothing would persuade me; I do not have a bicycle; and I do not cycle at all. Going through the 4 questions in turn. When asked in Q.1″ Do you think it’s safe to cycle on roads in built up areas or not?” 24 didn’t know. Two thirds of these were female and 17 were over 64. But of the rest, 565 said No and 414 said Yes. On that measure, Sustrans’ headline is accurate: 56% responded to the safety question with a clear NO. They don’t feel that cycling in built up areas is safe. Females were more likely to say cycling was not safe (63%) and males less likely (49%). Different regions yielded different responses too: Scotland and the North West were at 60% and 62% saying NO, while Yorkshire and The Humber were more sanguine at 50% and The North East 52%. On the question (Q.2) dividing the regular cyclists from the non or less-frequent cyclists the sample group had 194 classifying themselves as regular (more than once a month) cyclists, 342 as irregular (less than once a month) cyclists and 464 as non-cyclists. The interesting point here is that the number reporting that cycling is not safe in built up areas (565) outnumbers the number of people who say they cycle regularly (194) by nearly 3 to 1. However you look at that there are some cyclists who say they cycle more than once a month while agreeing that Britain’s urban roads are not safe for cycling. When asked in Q.3 “What, if anything, would make you more likely to cycle or cycle more regularly, on roads in built-up areas?” ideas were suggested by the following numbers of respondents: More care taken by drivers 439; More marked cycle lanes 431; More care taken by other cyclists 370; Slower cars as a result of lower speed limits 276; Nothing would persuade me 127; I do not have a bicycle 33; 137 did not cycle at all; and 9 didn’t know. The surprises there perhaps are the smaller number calling for lower speed limits and the relatively small number who do not and would not 137 plus 127 (30%). On the specific question of 20mph limits (Q.4) 70% thought all councils should adopt them. 66% of men and 75% of women agreed with the suggestion. In summary, the results of this survey show that a lot of people regard cycling in built up areas as not safe. Their focus on “more care” from drivers and other cyclists suggests that Henbrow’s “subjective” and “social” dimensions of safety are very important. The broad agreement with a 20mph limit is encouraging. One strong message for the current campaign is that 431 (53%) of the sample would see extra cycle paths as being the kind of safety improvement that could persuade them to cycle more than they do. There do seem to be people out there who are ready to be persuaded. Their anxiety about others behaviour might be a question to pursue with more qualitative research. In the context of a harsher economy and a move towards greater individualism the urge to compete rather than cooperate might be getting stronger. Another significant figure is in the age data. The 16-24 age group had 52% reporting that they cycled at last once a month. For each subsequent age group the proportion of self-declared cyclists was dramatically lower: 22% of the 25-34s, 20% of the 35-44s, 16% of the 45-54s, 11% of the 55-64s and 6% of the over 64s.